"It was the fight that changed my career. I felt immortal." Never mind the fight of Joe Calzaghe's career, his super-middleweight demolition of an American hailed the 'next Mike Tyson' is arguably the best performance ever by a British boxer. "Forget Britain, I have never seen a better performance than that in the world," said Jeff Lacy's renowned trainer Dan Birmingham in the immediate aftermath of the points destruction when Calzaghe threw an incredible 1,006 punches. 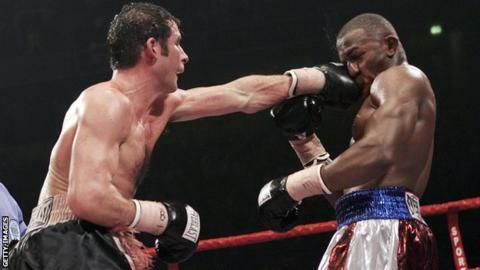 It is 10 years on Friday since Calzaghe unified his division in a boxing "masterclass" that will live long in sporting folklore - and it was the night the world and lucrative American audiences woke up to British boxing's best kept secret. Calzaghe may have brought the curtain down on a glittering unbeaten career fighting two American legends in boxing's spiritual homes of Las Vegas and Madison Square Garden - but it is the schooling of another American that defines his 25 years as a professional boxer. Already a world champion for nine years, the Welshman was a huge underdog with bookies and pundits alike - add to that, he was desperate to pull out of the unification bout because of a long-standing wrist injury. But he battled through on the advice of dad and trainer Enzo Calzaghe. And it paid off handsomely. Calzaghe had been WBO champion since shocking the great Chris Eubank in 1997 but his star was on the wane - and he was dismissed by the influential American media as another overhyped European fighter. "Joe was injured all the time, fighting domestic fighters and was doing it on satellite TV, people weren't interested in him," Enzo recalls. Calzaghe Jr added: "The fight before Lacy, I got booed out of the Cardiff Ice Rink for my fight against Evans Ashira, when people didn't know I was injured. I was a frustrated champion for eight years but knew the Lacy fight could put my career to another level. " Less than a month before the fight, Calzaghe damaged his wrist sparring. "I bought into the hype, I didn't think I could beat him injured, I underestimated myself and my ability," he told BBC Radio Wales. "It was my dad who convinced me to take the fight. I was in the best shape of my life and dad could see that. "The doctor told me not to fight, but dad wasn't having it. The special relationship we had, nothing demonstrated it better. He said I could beat him with one hand - and he was right." Enzo added: "I told him he might as well retire if he pulled out because people would think he was a joke. I was harsh with him. I needed to be." Only a few pundits backed Calzaghe against Florida's finest while bookies gave him no hope but the Welshman recalls: "On the day of the weigh-in all the nerves melted away, I looked in his eyes. I knew. "Lacy looked stiff, he looked tight, he looked tense. It was a big leap for him. How relaxed and confident I was, I could see that was bothering him, he probably wasn't used to it." 'Left Hook' Lacy was undefeated in 21 contests and had knocked out 18 and as the legendary Sugar Ray Leonard recalls: "Calzaghe was supposed to be an easy opponent for Jeff Lacy to annihilate and that was a huge, huge upset for the boxing critics and historians and even myself." Calzaghe's performance was majestic. He landed over a thousand punches while Lacy's reply was 444, landing just 116. Calzaghe won every round and put Lacy on the canvas for the first time in his career. Lacy just about survived to the final bell. "That for me was the best performance by a British boxer that I have been involved with," said long-serving promoter Frank Warren. "He took him to school." Lacy last fought in January 2015 and lost four of his last six contests, a total contrast to Calzaghe who retired in 2009 with an unblemished 46 and 0 record and finished his career beating greats like Bernard Hopkins and Roy Jones Jr.
Calzaghe owes Lacy and concedes: "I am grateful because he came to the UK and laid it all on the line. "My popularity after fighting Lacy was great, it was the fight that changed my career. Ten years on and I am really proud of it. That was the fight when I made boxing history. It was my masterclass."